Amazon is the world's largest online store. 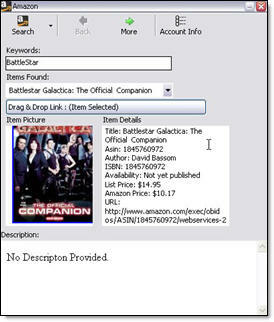 You can access the thousands of items for sale at Amazon and recommend them to your readers. If you are an Amazon Affiliate you can make money with you embedded Affiliate ID referenced in any content used from this dialog. Give Elicit a try and start making money today. Want to know more details? Read the full Online help. Context Ads are a powerful way to make money. Elicit provides the maximum targeting and control possible by allowing you, if you a Chitika "Blog Context" member, to create ads using keywords that you choose and then drag and drop them into the content editor. 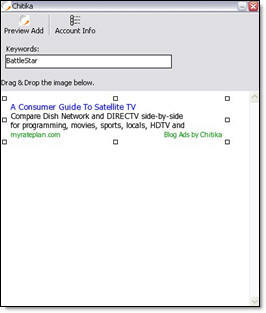 You can preview each add and try different combinations to find the best ad for your entry.